If children’s fundamental rights are guaranteed by Algerian law, the reality is very different: poverty, limited access to basic medical care, abuses or child refugees are some issues that need to be addressed in Algeria. 23% of the Algerian population live under the poverty line (less that $2 per day). Poverty in rural areas is two times higher than in urban areas. Child labour is a part of the daily reality for approximately 5% of children aged between 5 to 15 years in Algeria. In the last few years, the number of children who stop going to school and start working, sometimes in difficult situations, in order to support their parents is increasing. Despite the fact that the minimum age for marriage is set at 19 years (with some exception) in the Algerian Family Code, child marriage still exist in certain ethnic groups. 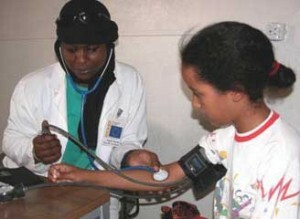 Infant mortality rate in Algeria is 32%, still very high. In addition, approximately 10% of children are not vaccinated against dangerous diseases. In general, access to basic heath is still a problem in rural areas. In 2010, more than 4,600 cases related to physical and sexual aggression and abuses against children have been recorded by the Algerian police. We must admit that most of the cases are not disclosed because children are afraid of reprisals and sometimes do not have the opportunity to denounce the violence. Therefore, it is much higher in reality. Much of the time, the perpetrators come from parents, members of the inner family or even the teachers. Child abuse is still taboo in Algeria and is, in some cases, considered as a disciplinary action. In order to protect Children’s Rights, the Algerian government must plan and build up an information system and a legal intervention mechanism for prevention in cases of abuse. 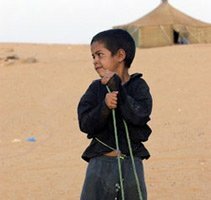 For 35 years, Algeria has welcomed a large population of refugees in the west of the country (Toundouf); about 196,000 Sahraouis live in refugees camps in difficult and severe conditions. Children live without electricity, toilets and with limited food and water. They live in tents and mud buildings. The refugees depend on humanitarian assistance. Schools have been built by NGOs but almost half of the children abandon the system before they complete primary school. In addition, they do not have access to all the necessary basic health care, like vaccinations. Love children are those born of parents who are not married. In Algeria they are often discriminated against. Some laws aimed at protecting the rights of children do not include the rights of love children. Being a single mother is quite often considered as a shame in the family and many love children are abandoned at birth (about 5,000 babies every year). Certain parents keep their babies, place them in adoptive families and arrange secret visits from time to time. It is very uncommon to see a father who accepts to be a father without a legitimate relationship. Consequently these children do not have any paternal identity and are rejected in the society. A new law that forces biologic parents to accept their children after DNA testing has been passed but Algerian mothers who start the procedure face real difficulties. It is very difficult to change mentalities in Algeria.